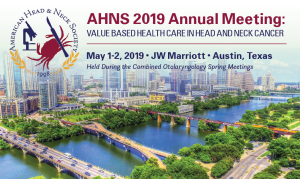 Abstract submissions for the 2019 AHNS Annual Meeting are closed. Acceptance Notifications will be sent late-January 2019. Registration for COSM will open Tuesday, January 22, 2019. More information regarding the 2019 program coming later in 2018. Housing site is now open! For more information please visit the COSM website. Should you have any questions, please contact AHNS Headquarters at christines@ahns.info. To view the Final Program, full abstracts and meeting information from the 2018 Annual Meeting, please click here. To complete the 2018 Meeting Evaluation and Claim Your CME, please click here.